Is email marketing successful or just plain easy? Email marketing continues to be the “number one” – but why? Email marketing is constantly being rated as the “number one” method of marketing by online marketers. There are dozens of surveys and studies which show that marketers rate email marketing as their most successful method of gaining business. There is plenty of research which shows that email marketing generates more sales and more leads than other forms of internet marketing. However, a new study shows an interesting twist to this long-held belief. It turns out that marketers rate email marketing as the easiest form of marketing. This suggests that there is a vast amount of email marketing going on simply because marketers find it easy to do. And with large volumes of email marketing happening you are likely to find it is more successful than other forms of digital marketing, simply because of the impact of the volume. 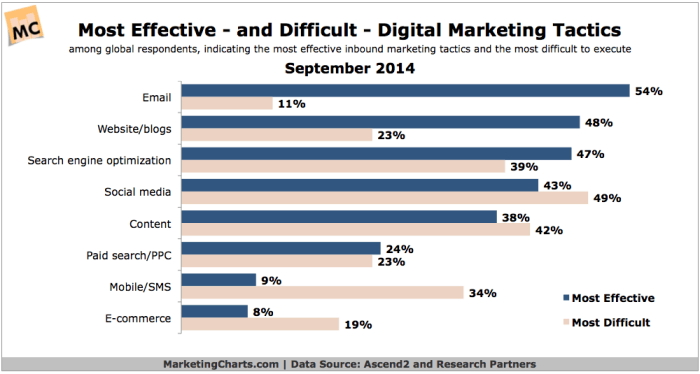 Marketers rate social media as the most difficult form of online marketing that they do. They rate this as their fourth most effective kind of marketing. When you consider other elements of marketing which they also find difficult, such as SMS marketing or marketing through ecommerce channels, you can see that things rated as more difficult tend to be rated as less effective. Independent analysis, by firms such as HubSpot, shows that content marketing is by far the single most successful online method of generating sales. Yet, marketers believe this is one of the least successful elements, behind email marketing, a website, SEO and social media. But they also rate it as one of the most difficult kinds of marketing they do. They don’t rate it as that successful because they find it hard to do. What this data suggests is that email marketing might not be the “holy grail” it seems. It might just be that people find it easy and therefore reckon it is valuable. Sometimes, a business benefits when you concentrate on the more difficult tasks, rather than the easy ones. Just because it is easy and it produces results, does not mean that email marketing is better than something else, such as content marketing which is more difficult to work with. Don’t let a marketing task’s difficulty fool you into believing it will not be successful. We might be being fooled into believing that email marketing is the most successful form of online marketing, when in reality what we are actually measuring is its ease of use. Print or TV? The Media that Won the Battle for Your… Print, TV, Radio are now perceived as "unconventional," as fewer people use them. That's the reason old media are becoming effective again. Does business use of social media do more harm than good? Study shows that business activity on social media only works in the short-term. Long-term it leads to reduced sales. How does Page Speed affect your sales?